Ever since I was a kid I have always struggled with my weight. When I started high school and into my sophomore year, my body image became a problem in my eyes. It’s was a moment in my life I never want to revert back to again. Even though I was a football player for 8 years I knew I needed to lose weight. Being 16 and weighting in at 260 pounds is not natural. When I met Jason, right away he knew what actions must be taken to get me where I needed to be with my goals I had in mind. Jason transformed me into a whole different person from what I used to be. I went from 260 pounds to 180 pounds in 5 months training with Jason. By far, Jason is the most hard working person I know. He always looks out for his clients and has a big heart for people. Jason has always pushed me to go the extra mile even when I thought I couldn’t, but he knew I could. Because of Jason, I now am always aware of my diet and how I workout. As of today I can say I workout almost every single day and I love every single moment of it. Still to this day even if I think I can’t do an extra set or an extra repetition I picture Jason’s voice in my head telling me not to give up. 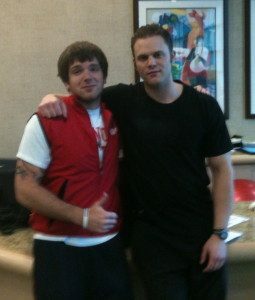 As of today, I work as a personal training director at L.A Fitness thanks to Jason and his inspiring personality. His workouts will transform you as a person inside and outside, I guarantee that 100 percent. If I could go back and workout with him again I would, no questions asked.